Avlite AL-01 LED Area Light - Avlite has created a unique light head housing eight state-of-the-art, high-performance, power LEDs for optimal area illumination. Each LED bank is driven by high efficiency LED drivers maximising light output and LED life. The intensity is maintained at a constant level over various voltage shifts. The light head body is constructed from extruded aluminium with injection-moulded, UV-stabilised, LEXAN® polycarbonate glass-filled end caps for superior strength and durability. The injection-moulded LEXAN® lens is fitted to the aluminium body with a marine grade o-ring ensuring superior sealing. 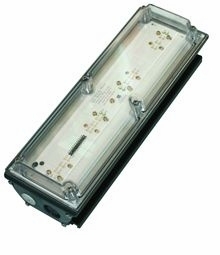 The AL-01 LED Area Light has an ingress protection rating of IP68 ensuring that internal electronics are completely sealed and protected from water intrusion and dust when installed in the toughest environmental situations. The custom designed aluminium extrusion is interfaced with a thermal LED substrate to reduce the build up of internal temperatures. This prevents excess heat from LED operation and external temperatures combining to create unwanted stresses on electronic and mechanical components. Less thermal stress equates to product reliability. A membrane vent is used to equalise pressure in the light to that of atmospheric pressure. this permits improved protection of electrical components by reducing any pressure build-up on the sealing. The AL-01 outdoor LED luminaire can be manufactured using different coloured LEDs, enabling the colour of the light to be altered using the optional Radio Control. If required the light can also be set to cycle through multiple colours adding another dimension to LED area lighting.